It was 1851 and Harmon Heald, like many of California’s first settlers, was looking for gold. And like most, he found no nuggets. But he built his cabin, and later a general store on the main road between the gold fields and San Francisco. So he found a share in the gold that had already ignited the economy of the recently created state of California. And he built the beginning of small town perfection – Healdsburg. As his success attracted more settlers to the area, Heald designed the first plaza and laid out the streets that would become the town of Healdsburg. The newcomers quickly discovered that the fertile California soil could grown anything, especially grapes. By the mid-1880s, a flourishing wine industry had already begun to develop, and despite a blip during Prohibition, this region has become one of the world’s premier wine producing regions. In fact, Healdsburg is at the center of three wine areas – Russian River, Dry Creek and Alexander Valley, with plenty of tasting rooms to sample their wines. And where there’s wine, there’s great food. It’s Sunday, and like many of the citizenry of Healdsburg, California, we’re at The Downtown Bakery overlooking Harmon’s beautifully designed plaza. 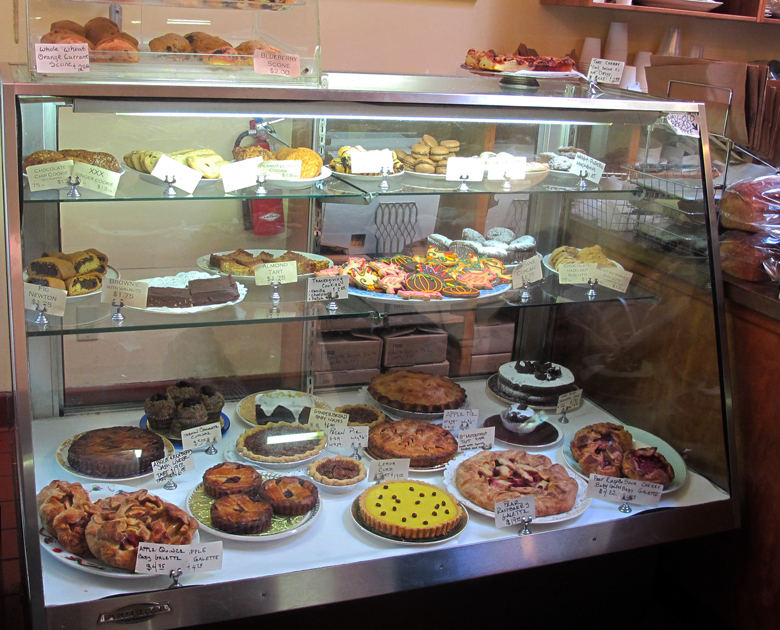 Begun by three colleagues from Chez Panisse in Berkeley, the Downtown Bakery has remained true to the vision of sustainable, local and organic cuisine. 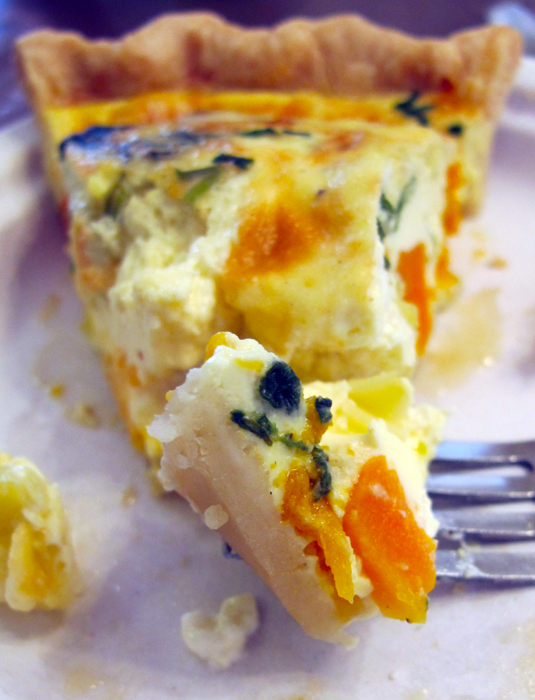 My quiche is filled with butternut squash, leeks, spinach and goat cheese, and it’s gorgeous. Ed has eschewed this girly offering for a hearty sandwich of roast turkey, Monterey Jack cheese, avocado, arugula, pickled onions and house-made mayonnaise on a ciabatta (why am I tempted to finish that list with a little tune and the words, “on a sesame seed bun”?). But he takes a taste of my quiche and says, “Real men DO eat quiche. This is really good.” It is! But real women eat sandwiches too. His is moist and loaded with flavours that keep coming at you. This is not the only spot that has adopted the locavore ethos. Healdsburg boasts a good many fine restaurants, all nurturing the connection between that good soil and the area’s cuisine. SHED, winner of the 2014 James Beard Award for restaurant design, combines a café offering seasonal menus with a market offering locally grown and produced fare. And at the Healdsburg Hotel, Dry Creek Kitchen, headed by Chef Charlie Palmer, offers the sort of dining one rarely expects to find in a small town. And that’s the point. Healdsburg is a small town.. Indeed, picture a quintessential small American town. 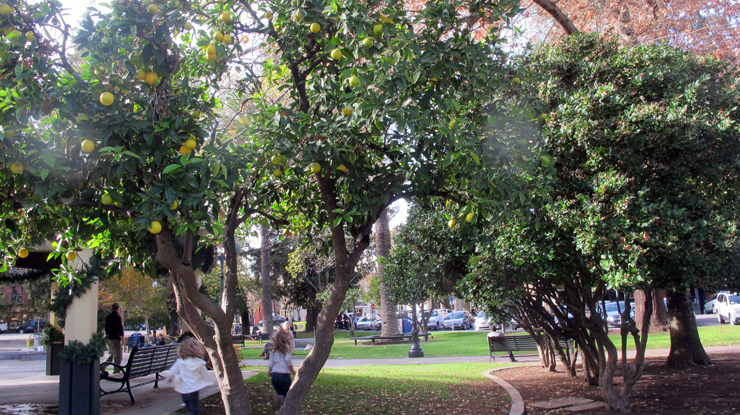 It has a central square – a green, tree-lined gathering place around which are shops, restaurants, businesses and streets bustling with people. 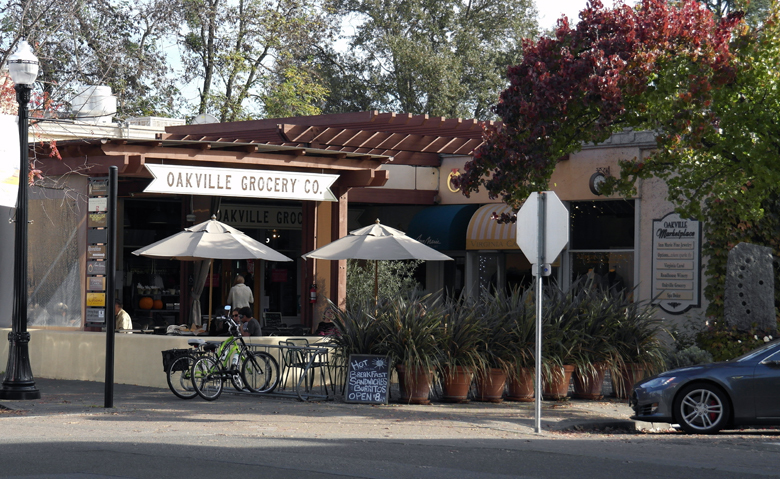 There’s even a charming little grocery store – the Oakville Grocery – which features the following on a sign: Italians settled in Sonoma County in the 1800s, bringing with them a passion for family traditions, food and wine. We celebrate those pioneers. This is Healdsburg. But this small town, being set in the heart of Sonoma County, boasts a backdrop of scrub covered mountains and geometrically linear vineyards. And the plaza’s topiary includes palms, orange trees which are covered in fruit when we visit, and a huge California Coastal Redwood. It was planted by the good citizens in 1924, says a museum plaque by the tree, to commemorate the completion of the Redwood Highway from the Golden Gate Bridge to Oregon. 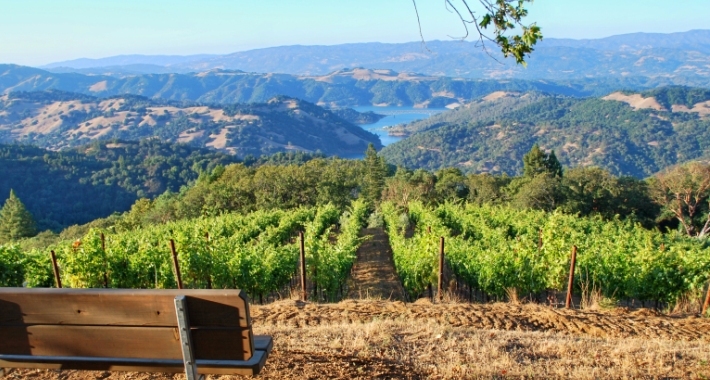 Visitors to the Gustafson Vineyard in Dry Creek enjoy spectacular views. And here’s a quirky activity you’ll probably find nowhere else: in April, you can help harvest roses and distill them into fragrant rose oil and rosewater as part of the Classic Perfume Rose Harvest & Distillation Tours. This entry was posted in California, Food and tagged Charlie Palmer, chef, Classic Rose Harvest & Distillation Tours, Downtown Bakery, Dry Creek Kitchen, Healdsburg, Healdsburg Hotel, Oakvillle Grocery, quiche, rose harvest, SHED, small town America, Sonoma, wine by Liz Campbell. Bookmark the permalink.